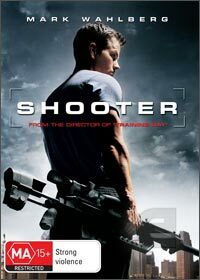 Starring Mark Wahlberg, The Shooter is about an army sniper who lives in seclusion from the world with only a dog for company and his arsenal of weapons. This is a well paced film with Wahlberg certainly proving he is up for the job and then some with the impressive resume he has been building up over the years of challenging roles that he has carried off to perfection. As it turns out, The Shooter is hired by the government to plan out an attack on the president of the United States as a precaution against such an event. One thing leads to another and he is suddenly on the run as the government he has sworn to protect turns against him as does the group who have set him up. Look it's not the greatest plot in the world, nor one that has never been explored before, however The Shooter provides a stack of great action scenes, good dialogue and a ride that is more than worth the trip. The special effects are well up to standard and filled with all the prerequisite things that make for a cool action flick. I certainly enjoyed it thoroughly and have since made the trip through the film numerous times. I have no problems with recommending this movie to any audience who enjoys fast paced thrilling action titles. Wahlberg totally owns the role and as always shows his strengths as an actor along with a great supporting role from Danny Glover and Ned Beatty, as well as a host of other good talent. Hire or buy this one today, you won't be disappointed.